What goes up must come down. Mountains, by definition, are a whole lot of up, so the potential for disaster is ever-present. This was shown pretty forcefully with the recent Mount Meager landslide, which was actually triggered by a snow and ice avalanche higher up on the volcano’s glaciated slopes. (Here are some pretty outstanding aerial photos of the disaster). Volcanic rock is notoriously weak and unstable, and the recent Meager slide is only the latest in a long history of outburst-floods and landslides among the southern Coast Mountains ancient volcanoes. we struck into a lagoon, or a large tract of overflowed land. The Indians say this was overflowed three years ago. We found the cause of it as we came along, a Lake has broken away in the mountains, and swept away ridge after ridge, covering a whole forest of timber, with rocks and sand for a space of 6 or 7 square miles, changed the course of the river, and not left a stump to be seen, where the tall timber stood three years ago. The flood, geologists now reckon, was the result of a landslide on “the Barrier,” an ancient lava flow that dams Garibaldi Lake and is plainly visible from the Sea-to-Sky highway linking Whistler to Vancouver. When a portion of the Barrier fell it released a smaller, temporary lake that had formed above the cliff. The resultant flood washed out much of the Cheakamus River valley, while drowning large stands of timber which afterward stood as lifeless markers of the catastrophe. The Barrier and Rubble Creek beneath Garibaldi Lake. Photo: Natural Resources Canada. More than fifty years later, during construction of the PGE Railway, rail engineers found a practical use for this sombre scene. Many of the dead trees standing in the Cheakamus River’s new path remained structurally sound, so they were cut off at a level height and used as piers for a bridge across the river. Traveling through the valley in 1936 on a ski-mountaineering trip, Don Munday was still able to find sections of the leveled-off tree stumps, roughly eighty years after the initial flood. A few years prior to Don Munday’s visit to the region, city of Vancouver engineers deemed the Barrier too unstable for a proposed hydro-electric development, and the city subsequently, removed its objections to a planned expansion of the recently created Garibaldi Provincial Park. Today, one of the main trail-heads into the park is located right beside the Barrier; the massive, crumbling wall looms in plain view, just a few hundred meters from the parking lot. In the 1970s, further geological studies below the Barrier found a large layer of debris dating back to the mid-nineteenth century, presumably the cause of the above-described flood. The scientists also identified a distinct layer of debris further down, which they estimated at between five hundred and a thousand years old. This corresponds with Squamish oral tradition which recalls how an earthquake-triggered landslide once buried a number of people camped near Rubble Creek, the appropriately named river that drains Garibaldi Lake through the base of the Barrier. Not surprisingly, since then, the provincial government has declared the whole area at-risk, and no development (aside from the aforementioned, and recently upgraded highway) is now permitted in the vicinity. A few days after writing my last post about glacial lakes, I came across this example of one while hiking in Garibaldi Park. 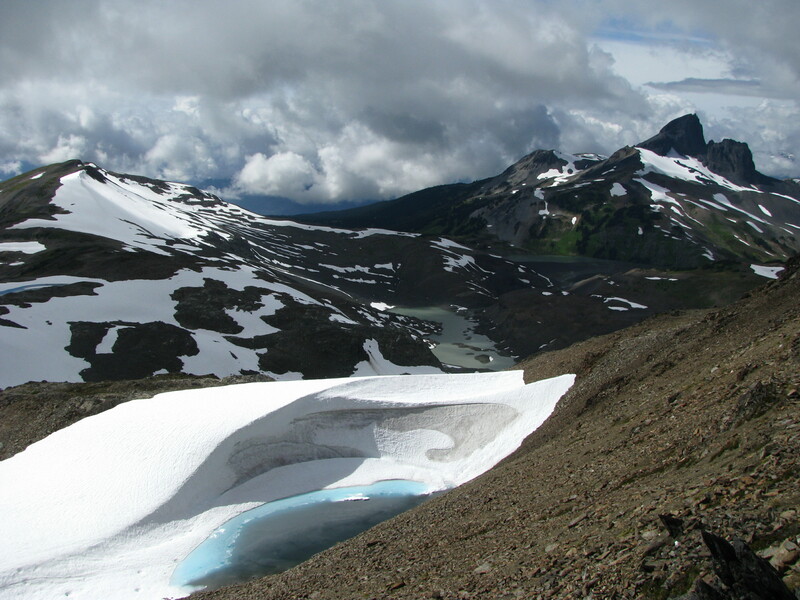 It’s a “marginal lake,” meaning that it is contained along the side of a glacier. Most of its contents have drained or evaporated since the spring melt: note the bottom of the dust marking the glacier’s edge–roughly the same level as the glacier’s low-point to the left–indicating the lake’s high-water mark. It is relatively small (maybe 100m long) and is pretty well contained, so it probably never posed any flood risk to hikers/campers on the Black Tusk Meadows below.